In contrast to the refugees Australia imprisons offshore, the white South African farmers that the Australian government want to fast-track for humanitarian or other visa programmes are some of the most privileged people on the planet. While refugees are kept in offshore detention centres on Manus Island and Nauru, white South Africans have been identified for fast-track humanitarian and visa programmes. Sarah Keenan is Senior Lecturer in Law at Birkbeck, University of London, and Co-Director of the Centre for Research on Race and Law. Last Wednesday, Australia’s Home Affairs minister Peter Dutton announced that his department was examining a range of methods to fast-track white South African farmers for humanitarian or other visa programmes, due to the ‘horrific circumstances’ the farmers are facing. ‘From what I have seen,’ Dutton said, ‘they do need help from a civilised country like ours.’ The statement came days after the South African government took a tentative but significant step toward the realisation of long-promised post-apartheid land reform. That Dutton would portray this move redressing structural racism in South Africa as a humanitarian catastrophe requiring pre-emptive rescue measures reveals much about Australia’s white fragility. The term ‘white fragility’, first coined by critical race scholar, Robin DiAngelo, has recently made it into Oxford Dictionaries, where it is defined as ‘discomfort and defensiveness on the part of a white person when confronted by information about racial inequality and injustice’. As DiAngelo explains, this discomfort and defensiveness results from white people having been insulated from race-based stress, and thereby built up high expectations for racial comfort while lowering their ability to tolerate racial stress. While the concept was developed to explain interpersonal relations, Australia’s treatment of refugees displays white fragility at a geopolitical level. Because Australia is only reachable either by plane or by a long and treacherous boat journey crossing the south Pacific, it receives a tiny number of irregular migrants compared with Europe and the US. Its geography largely insulates it from the global reality of mass dispossession and forced migration. When confronted by boats carrying these black, brown and predominantly Muslim refugees, Australia treats them as a serious threat to national security and sovereignty and meets them with military defence. Since 2013, Australia has spent over Aus$10 billion on its uniquely cruel refugee deterrence system, paying the Papua New Guinea and Nauru governments to host privately run detention centres imprisoning hundreds of people who sought asylum in Australia by boat. 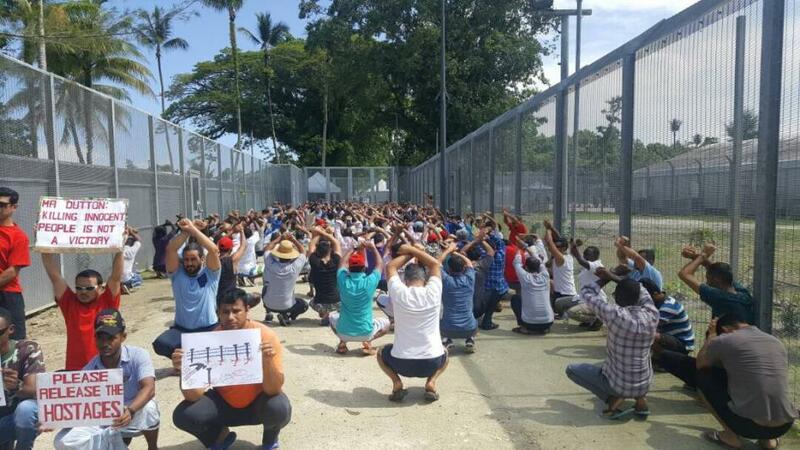 This regime, which has been condemned by the UN as breaching the Convention Against Torture and seen two refugees self-immolate, is justified by the Australian government as being necessary to ‘keep our borders safe’. In contrast to the refugees Australia imprisons offshore, white South African farmers are some of the most privileged people on the planet. White people make up just 8% of South Africa's population yet own 72% of its farmland. This massive racial inequality is a legacy of Dutch and British colonialism, most significantly the Natives’ Land Act 1913 which allocated just 7% of the country’s land to black South Africans, who then made up 80% of the population. The Act brutally forced the majority of the native population off their land, making them a cheap and plentiful labour force for white exploitation. The much-celebrated end of apartheid in 1994 did not redress this massive disparity in land ownership, leaving whites with the land their families acquired under the previous white supremacist regime, and blacks living in poverty in the townships. There is no evidence to support the claim that white farmers are more vulnerable to violent crime than any other South African. In fact, the group most vulnerable to violent crime in South Africa is young black men in urban areas. Land reform has been on the agenda for post-apartheid South Africa for over two decades. Dutton’s unsolicited offer to white farmers came just days after South Africa’s National Assembly passed a motion for land expropriation without compensation. The details of this project are yet to be revealed, but for it to go ahead South Africa will need to amend its constitution, which is likely to be a long and difficult process. White farmers are not about to be violently and systematically forced off the land in the way blacks were forced off theirs from 1913. For the Australian Home Affairs minister, however, the very idea that land could be expropriated from white farmers as a means to redress racial injustice and inequality is a terrifying and intolerable one. His direction to his department to urgently find legal routes for these farmers to migrate to Australia constructs the possibility of real post-apartheid land reform as a humanitarian emergency. Australia’s political and legal systems and its dominant white culture perpetuate an unblinking refusal to acknowledge that present landownership is based on racial injustice, let alone consider taking steps to redistribute it. Australia is built entirely on stolen land. Australia remains the only former British settler colony never to have signed a treaty with the indigenous population. Colonial sovereignty was instead asserted on the basis that the land was terra nullius or ‘empty’, because indigenous Australians were not counted as properly human. White farmers are celebrated in Australia’s settler colonial imaginary as hard-working and worthy pioneers, their labour making vast expanses of previously ‘wild’, ‘empty’ land productive, and thereby building the nation. When, in the historic 1992 Mabo decision, the Australian High Court finally acknowledged that terra nullius was a racist lie, it refused to consider the logical conclusion that Australia’s sovereignty and white land ownership might also be illegitimate. To do so, one judge said, would be to ‘fracture the skeleton of principle’ which underlies Australian law. This was an obtuse way of acknowledging the very fragile foundations of today’s Australia. When Peter Dutton announces fast-track visas for hypothetical white South African refugees, he inadvertently does the same.